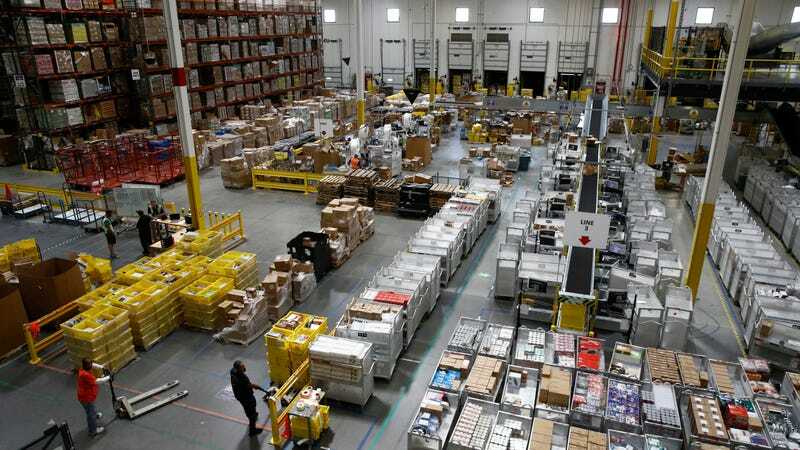 An Amazon warehouse in Baltimore, Maryland. E-commerce giant Amazon has long been reported to be an unpleasant place to hold down a job. Article after article has relayed claims of an ultra-competitive workplace culture, employees being treated like soulless robots, sweatshop-esque performance requirements, and long hours of monotonous work. That includes mandatory seasonal overtime that some workers have said sometimes results in injuries. Some of the calls involved individuals who were upset about matters unrelated to their work at Amazon, while others involved individuals not employed or contracted to work at the facilities. And while the Beast report noted it did not have any evidence that Amazon staff had more workplace mental health crises necessitating intervention than those at other companies, it did find that many of the incidents appear to have been related to work conditions. Eventually, after Veasley told a guard at the facility he wanted to drive his car off a cliff, Amazon summoned police and he was placed under a three-day hold at a psychiatric ward. “That place screwed me up so much it put me into a depression where I was actually on a 72-hour hold in a psych ward,” Veasley told the Beast. Of the six current or former Amazon workers who spoke to The Daily Beast, five were put on leave from work. They said they struggled to obtain promised compensation, found counseling was insufficient or unaffordable, and in some cases they were fired. After being removed from Amazon by emergency responders—a situation some found humiliating—workers were often put on short-term medical or disability leave, entitling them to 60 percent of their pay and a return to their job after psychiatric clearance... While on leave, some workers used the company’s employee assistance program, which includes three phone conversations with a counselor, and also sought outside psychiatric help. Even with Amazon-provided health insurance, the costs were often a financial strain.